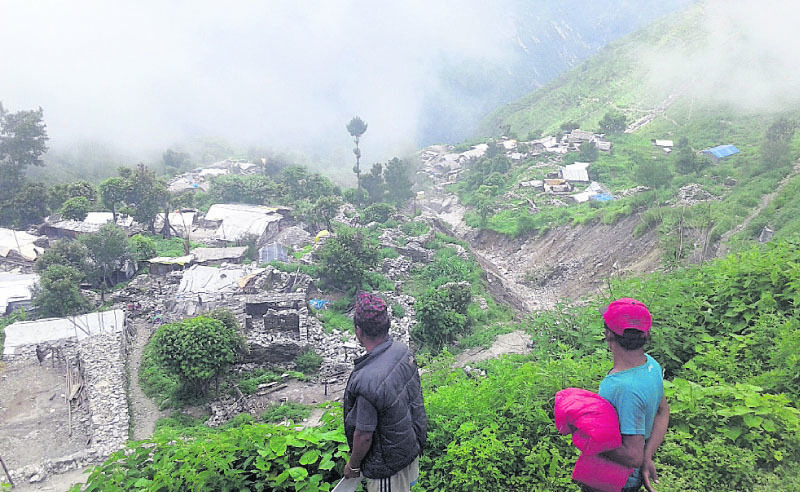 GORKHA, July 7: It has been more than two years since Nepal got hit by the catastrophic earthquake but still many victims who were rendered homeless by the disaster are obliged to spend yet another monsoon in their dilapidated makeshift tents. Many of the villages in Gorkha, which were devastated by the earthquake, have still not been relocated. This has compelled their residents to spend their third monsoon, after the quake, in misery. Incessant rain triggering continuous landslides and mudslides in various parts have added to their woes. 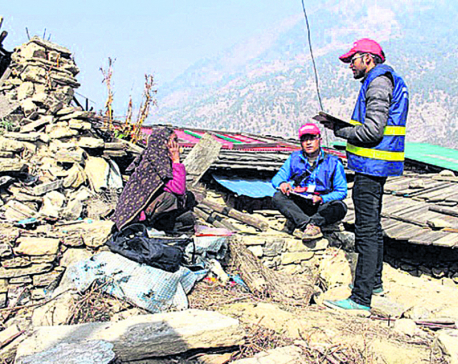 In the immediate aftermath of the earthquake, the District Natural Disaster Relief Committee (DNDRC) had announced to relocate 2,214 houses from 22 villages. The committee later announced that it cannot manage alternative for the resettling the victims, and urged the government for help. So far, no action has been taken on it. On the basis of the applications submitted by the victims and after inspecting the loss and damage the DNDRC had assured to relocate the destructed settlements of 11 VDCs of area 2 and 3. But nothing has been done yet. As the government took no initiatives for resettlement, locals of Keruaja village, which is vulnerable to landslides, have started building their houses on their own in the same land. “Though they had promised to move our houses to new place when they came to our village some weeks after the earthquake, we have never seen or heard from them after that,” said Suk Bahadur Gurung of Kerauja. Kerauja said that after being fed up by the false promises of the government and local authorities, victims have started making their homes on their own. “How long will we be able disturb our sleep to protect ourselves from falling stones, mud and rain?” he questions. Incessant rainfall triggering landslides in several parts have posed a serious threat to the lives of people here. “We might get swept away by the landslide anytime; only we know how we are risking our lives, almost every day,” laments Saney Gurung of Gumda village. Jitendra Basnet, chief of DNDRC, informed that some technicians had recently made field visits to inspect the infrastructural loss of Kerauja. According to Urban Development and Building Division Office (UDBDO), around 200 houses of Kerauja are in immediate need of relocation.